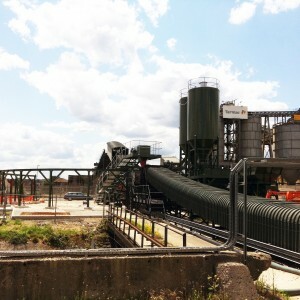 Day Aggregates, based in London, have recently started producing a new material, the EcoFILL 40, which is essentially made out of waste from utilities trenches. The hydraulically bound material (HBM) has been treated and is now being reused on various applications such as the reinstatement of utilities, new build roads and car parks. Day Aggregates are producing this new material using their new continuous mixing plant, supplied by Rapid International Ltd. The new continuous mixer, which is a modification on Rapid’s current mobile version known as the Rapidmix 400, can produce up to 400 tonnes/hour, allowing batch on demand. Hydraulically Bound Mixtures describe soil or aggregate mixtures that use binders made from cement, lime, gypsum, granulated blast-furnace slag, air-cooled steel slag and coal fly ash (also known as pulverised fuel ash or PFA). These binders are known as hydraulic as they set and harden in the presence of water. Using this material allows Day Aggregates to produce a more cost effective and environmentally friendly alternative to virgin type 1 sub-base. 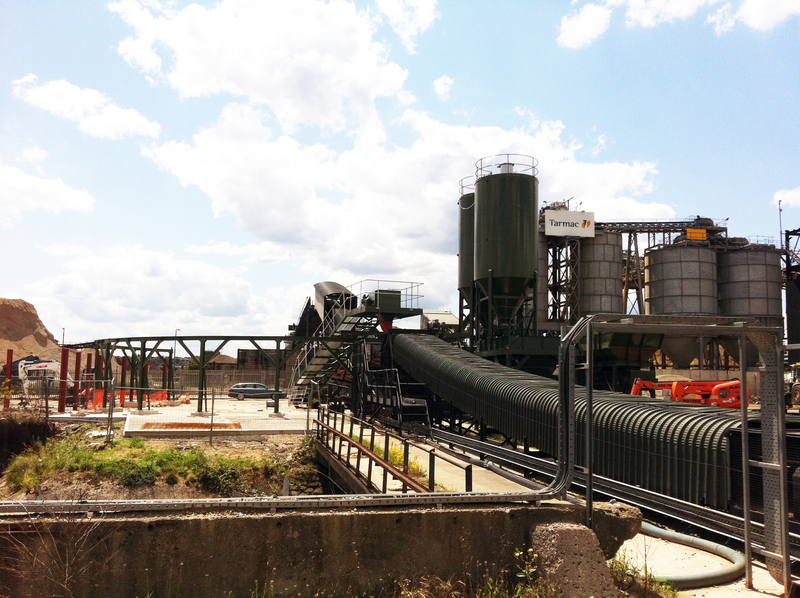 The plant is located on the bank of the River Thames. It has a ship unloading facility with a conveyor from a jetty across the site to stockpile bays on the main part of the site. The plant supplied was based around the pugmill mixer from Rapid’s mobile continuous mixing plant (Rapidmix 400) which was installed on a fixed skid mounted support frame. The system has 3 shovel fed aggregate bins and 2 silos for cementitious materials. The trench arisings material is screened and loaded into the primary aggregate bin, which has special design features for discharging difficult materials. The other 2 aggregate bins allow finer grade base material and also PFA to be added together with the trench arisings to help control the grade of the final material produced. The aggregate bins have belt scales to control the material quantities. These materials are fed onto a conveyor that takes the materials to the inlet of the pugmill mixer. At this point water and liquid additive can be added along with OPC and Lime powder materials from the two silos. At the outlet of the pugmill mixer, Rapid supplied a radial conveyor to give Day Aggregates several options for placement of the mixed material. The radial can discharge into waiting utility contractors trucks; it can form a mini stockpile beside the plant for later use; or the radial can rotate and convey the HBM material onto the existing ship unloading facility conveyor (if the material is good enough grade for new construction). The pugmill mixer can produce up to 400 tonnes per hour and is fitted with twin mixing shafts with mixing paddles configured to thoroughly mix the material whilst propelling the mix along the mixing chamber toward the outlet. A layer of base material is allowed to build up on the wall and floor of the chamber, protecting the rubber lined walls and base from wear. Adam Day says, “The cleaning system unique to these Rapid International pugmill plants was one of its main selling points”. As well as access lids on top of the mixing chamber, the sides of the mixer are hinged down hydraulically giving complete access to the paddles and interior for maintenance. Also the bottom of the mixer is formed by a conveyor belt, which is operated when clean out takes place, taking the waste material away on the radial conveyor, greatly simplifying (and speeding up) the cleaning operation. As Rapid International’s main market for this product range to date has been North America where measurement by volume has been acceptable, Rapid International have recently launched an option on their plant to record measurement by weight for European standards. As a result, Rapid expects to see an increase in orders for its Rapidmix range across Europe.